Provence Lavender Tour Includes: Our lavender tour in Provence includes private transportation and English speaking tour guide, scenic drive among lavender fields, admission to Lavender Museum or distillery, parking and tolls. 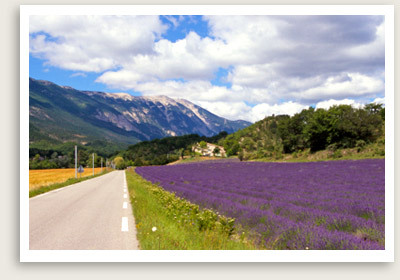 Note: This seasonal Lavender tour in Provence is only operated from June 15 to August 15. If you want to explore the weekly markets, you will need to schedule your visit on Tuesday for Gordes or Friday for Bonnieux. Embark on one of our unforgettable tours in Provence in our Lavender tour to see the lavender fields. You will enjoy this unique and aromatic “girl-friendly” day trip, and come to understand why the people of Provence are so passionate about this plant. All of your senses will be awakened in this fantastic lavander tour in Provence. First, a scenic drive on a steep, winding road takes you to the heights of the rugged Nesque River canyons. On your way down, you will be treated to an aerial view of the fields below, striped with golden wheat and purple lavender. You will take several photo stops in the lavender fields and have some free time in the beautiful medieval town of Sault on market days (Wednesday). After a nice lunch, you will learn all the benefits of the purple flower in a traditional lavender distillery (harvest season only) or in the Lavender Museum. You will also taste some lavender honey or some homemade nougat. Each person will leave this tour with a fresh bouquet.